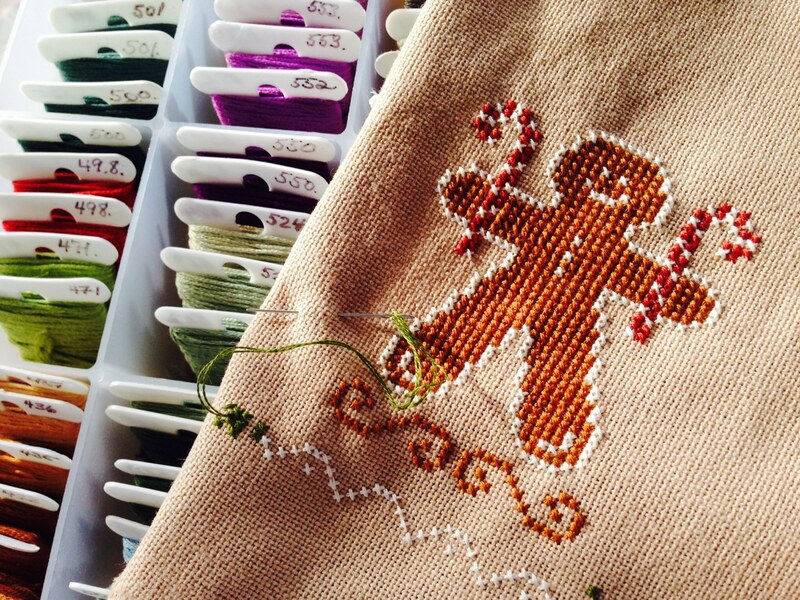 Here’s a quick snap of “Gingerbread Cookie,” now completed and sitting in my ready-for-finishing pile. The final stitched piece seems a bit over-sized for an ornament, so I may just turn it into a puffy pillow instead. This is obviously a “think about it” finish. A couple of years ago I started recording notes about my stitching projects in a little spiral notebook that I call my stitch diary. It’s full of random notes about thread count used, final stitched size, embellishments and details about how I planned and then ended up finishing the piece. Keeping records has been more valuable as a reminder of the charts I’ve stitched and to whom I gave them. It has happened that I’ve search for months for the absolutely perfect design for someone, stitched and gifted it, and then years later “discovered” the same chart and thought, now wouldn’t this be just perfect for so-and-so? Yeah, you guessed it. It’s as if I completely forget what I’ve stitched once I’ve given it away. The diary prevents that from happening. I only wish I’d started making notes earlier! Our beautiful warm Florida winter weather has finally returned so I thought I would sit out on the back porch for a little while today and stitch. 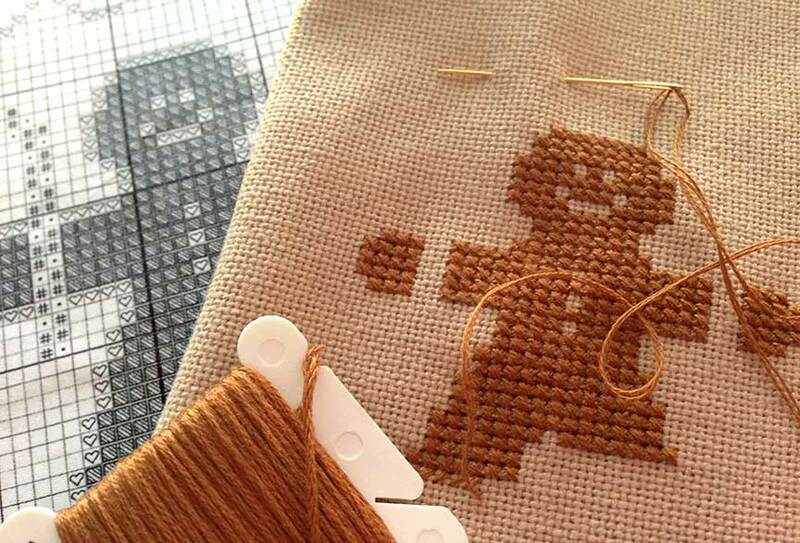 “Gingerbread Cookie” is ticking right along, it’s an easy stitch and very cute. All I have left is the border, so I imagine I’ll get done by tonight. Been thinking about my next project, an experiment that has been bobbing around in the back of my mind since before Thanksgiving. 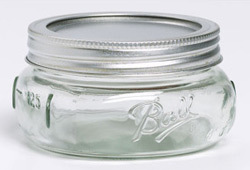 I’ve been saving several Ball half pint glass jars with widemouth lids which I hope to turn into simple little pincushion jars by adding some stitched padded inserts to the tops. The band openings are 3″ wide, so I used MacStitch to edit an existing chart from my stash to fit. I certainly have plenty of scrap material on hand to choose from and I’ve left one of the jars out on a side table as a reminder, hoping that I will get started as soon as the mood strikes me. I’m starting with a very simple design at first, to see if I like the idea, in which case I may try something more ambitious later on. 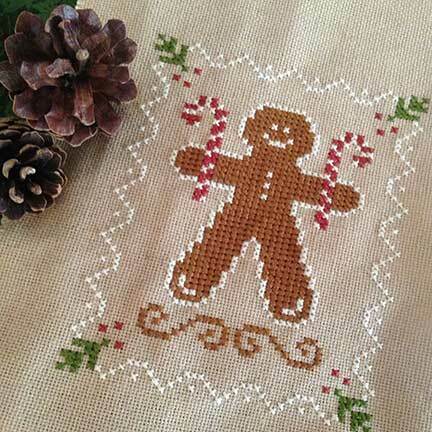 Well, I can’t say that I didn’t start early enough on this year’s Christmas presents, because I’ve just begun a Little House Needleworks chart called “Gingerbread Cookie, which was their 2012 Ornament #10. This is for another one of my sisters who never fails to remind me that I always used to bake gingerbread men for her holiday visits to our mother’s house. I think she will find this design an amusing addition to her collection. 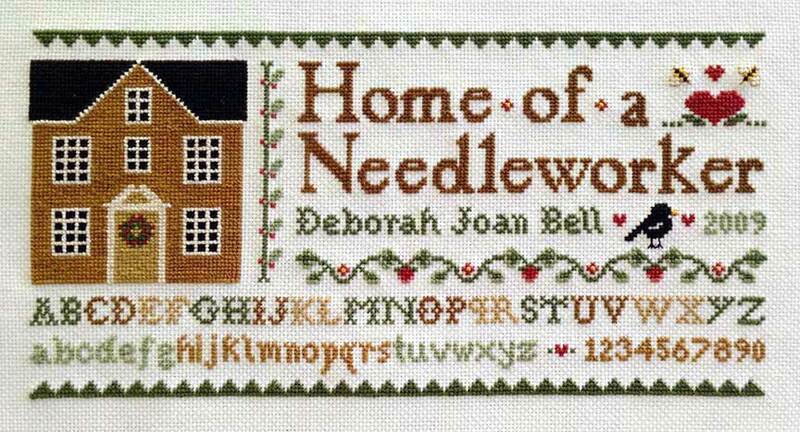 Finally completed my own “Home of a Needleworker” this weekend. The birdie is a plump little chap now, as I frogged and restitched him so that he would fit and balance better, and I added a couple of bumblebees “just because.” I’ll have to set this aside until I can make a frame for it, but I’m pleased to have finished at last. Joined the July SAL on Facebook just for the heck of it, and in hopes that participating will motivate me to finish my sampler which is almost, but not quite done. I only have a little bit more to do and then I can start on my next project! So, barring any additional CTS problems I hope to get some serious stitching done this weekend. 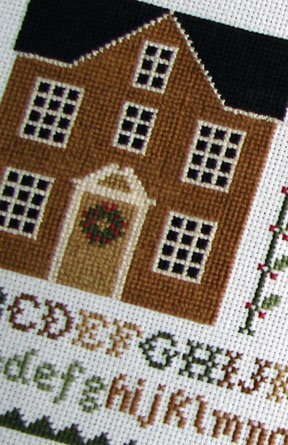 I stitch a little bit on “Home of a Needleworker” each night, but what with all those tiny stitches building a house on 22-count is slow going. I am determined to finish it this weekend, though. 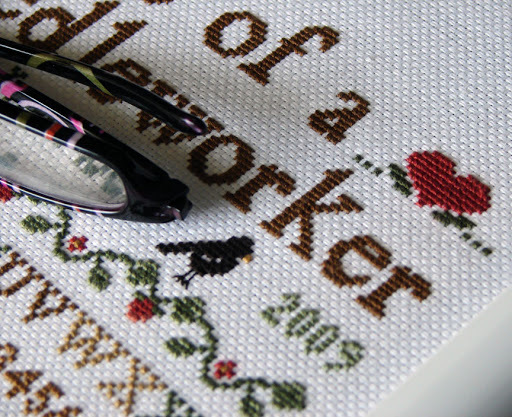 I do not have a multitude of WIPs going at once, because I hate having unfinished needlework laying around. I find that too overwhelming. I know other stitchers like working on several things at once, but I prefer the sense of accomplishment that I feel when finishing one project completely and moving on to the next one to starting a dozen things which I may never finish or lose interest in along the way. I may be wasteful in plenty of other areas, but never if I can help it with fabric and thread. Each project is like a puzzle to me, waiting to be solved. And I have always preferred forging ahead to a solution, and not meandering along the way. Lots more progress this weekend, and I’ve been thinking that I’d also like to add a few other small touches here and there, such as repeating some hearts or flowers just before and after the little bird. 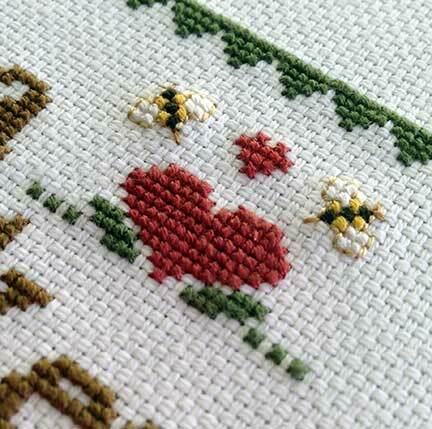 And I always like to stitch in a tiny bee or two somewhere, as that is my “trademark” on personal projects.